Heading back to our hotel room after another successful day of research, we stopped in the village of Kew to buy a bottle of wine and some flowers. We were going to be picked up by Toryn, and were headed to Martin’s house for dinner. There was a wonderful wine and cheese shop in the middle of the village and the owner was very helpful with picking a selection. Next door was a florist shop with so many different varies of flowers. We chose a simple but colorful bouquet. With that done, we headed to our room to freshen up and wait on Toryn. Right on time, Toryn walked into the hotel’s pub with flowers for both Kathy and I. We gave him a giant hug and were genuinely happy to see him. From the first time he stepped aboard the M/V Sea Hunter, I knew we would be good friends, despite our 30 year age difference. He is tall and handsome with a wide grin that lights up his face. On top of all that, he is extremely talented. He is an accomplished piano player, filmmaker and writer. While living aboard the ship we had lots of time to get to know one another. Toryn has traveled all over the world hiking and mountain climbing. He also plays in a band and produces music videos. I was looking forward to hearing about his recent adventures. 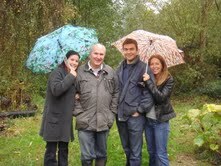 We all climbed into his car and set out to drive through the countryside to Martin and Claire’s home. Toryn had never been there before but was confident he knew the way. The first half hour went quickly as we got caught up on the last few months. We would ask a question and then he would ask one of us, all the while pointing out areas of interest. As we left the crowded highway and started driving towards the country, you couldn’t help to notice the changes. First of all, the roads were very narrow and since they drive on the opposite side of the road as we do in the US, it takes some getting used to. Bordering both sides of these narrow roads were huge bushes and hedges. As we would quickly round a corner (Toryn had a lead foot) you weren’t able to see what was in front of you. Then, being a bit confused, as we were on the opposite side of the road, it looked like we were crashing into a hedge. Both Kathy and I looked at each other with wide eyes more than once. As we got deeper into the countryside (and Toryn slowed down a bit) it was beautiful. The land was lush, green and rolling. We would drive through small villages and each one was a bit different and unique from the last. We stopped in one village to stretch our legs. We walked up and down a couple of the streets to get a closer look at some of the homes. As we walked, we noticed a sign that instantly caught our attention. 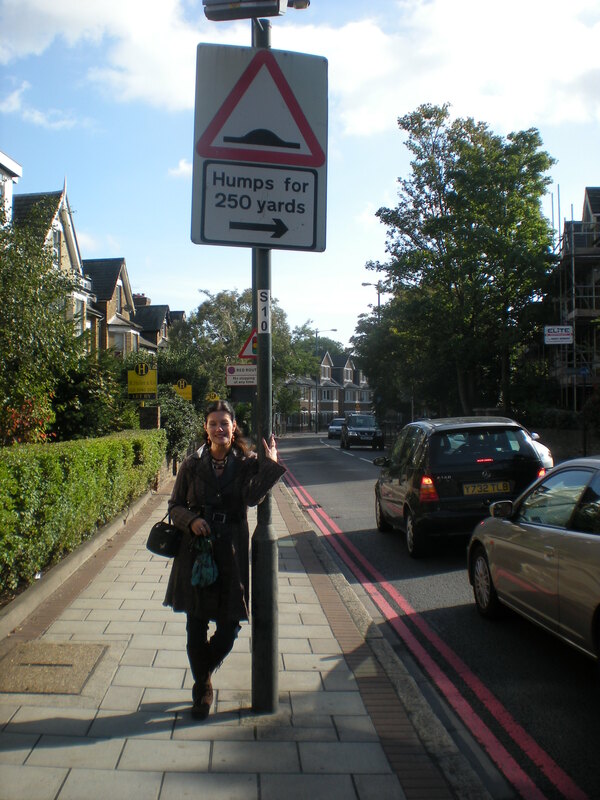 It said “Humps 250 yards”. We thought that was hilarious, so Kathy posed for a picture while Toryn shook his head. He didn’t get what the big deal was. It took about an hour and a half to reach Martin’s home, but it was well worth it. His and Claire’s cottage sat on a few beautiful green acres of land. As we drove up, they both came outside to greet us. It was lovely to see Martin again and finally meet his wife. Claire immediately made us feel comfortable with a big hug and welcome. We gave her the flowers and wine as we went inside to tour their cottage. There was a small sitting room with a wonderful fireplace that warmed the room. The home was cozy with lots of personal charm. There many family pictures scattered about. As we started catching up with Martin, Claire served us wine and appetizers by the fire. Claire was open and honest and couldn’t wait to hear stories about Martin while in the US. Of course, I let her know that although we loved having him and Toryn there, they were treated just like the crew. No special treatment was given and I even had to be firm with them once or twice. They weren’t full out slobs, but didn’t really pick up after themselves. On a few occasions I hid some of their things that were left around, hoping to teach them a lesson. Claire got a big kick out of that as she said he’s always been a slob. Of course, Martin defended himself and we all got a good chuckle. While dinner was cooking, Martin offered to show us the grounds. They had a couple of dogs who couldn’t wait to get outside and run. Claire put on a hat and grabbed her walking stick. She looked like a real character out of an English movie. As we walked deep into the back area, Martin pointed out particular trees and plants that were indicative to England. You could feel the love this area held as they both reminisced about their three boys and the wonderful times they had growing up on this beautiful land. We walked for quite some time as Martin gave us the history of the area. It started to rain and was getting a bit chilly so we headed back to the cottage. It smelled wonderful as we entered through the front door. Two of their sons (twins) joined us for dinner and shared stories with us. Claire cooked a fabulous English dinner and opened another bottle of wine. Martin was a good storyteller and shared some funny stories with us while Claire would speak up to correct him and give her side of the story. Everyone was enjoying the evening. After dinner we settled back into the sitting room for coffee and dessert. More stories and laughs continued. I felt I had known them forever. It seemed we were only there for a short time when Toryn mentioned we probably should be headed back. It was close to nine o’clock and we had a long ride ahead of us. As we said our good byes with hugs and kisses, I hoped I would get the opportunity to visit there again. As we settled back in the car, I realized how tired I was. We had been up since six that morning and going nonstop all day. As I closed my eyes, the day’s events ran through my head like a movie, and I was happy and content to see it again.